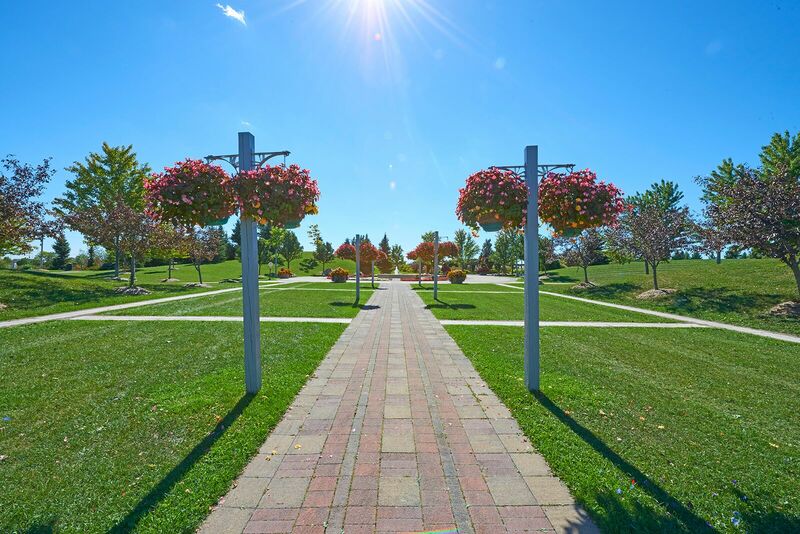 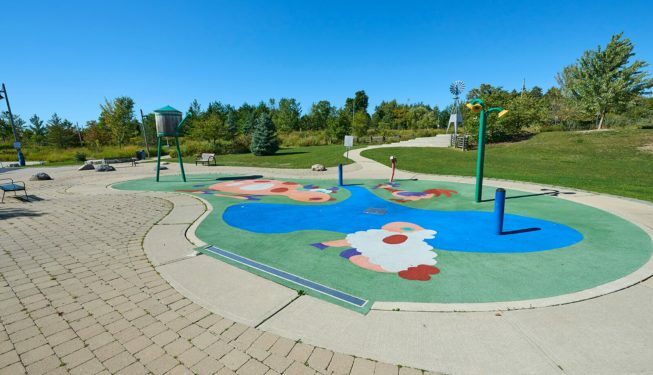 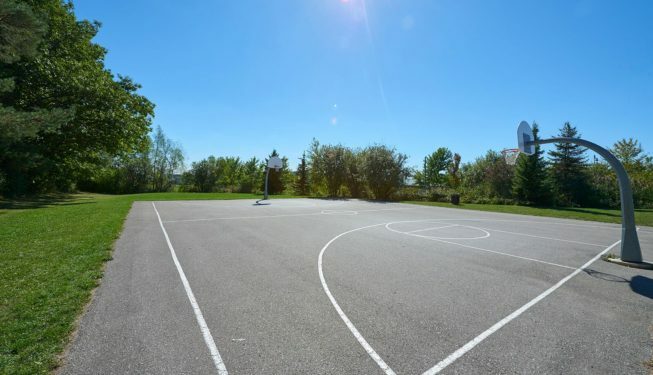 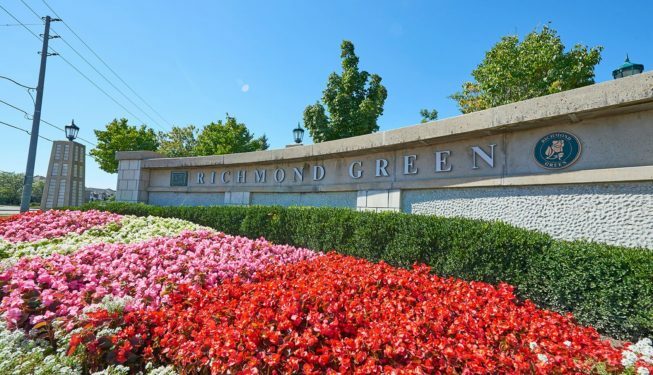 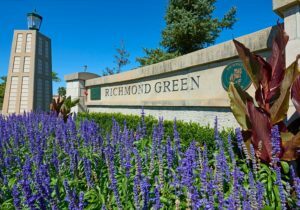 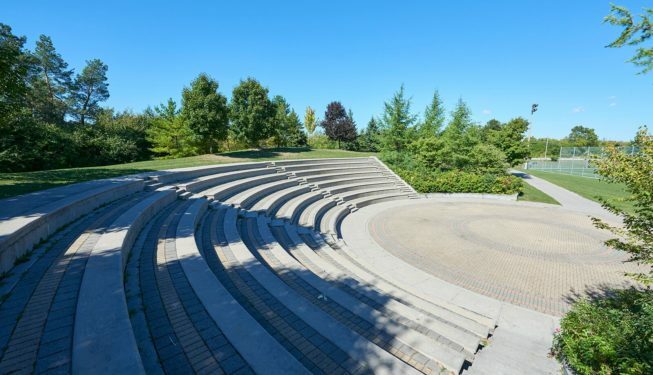 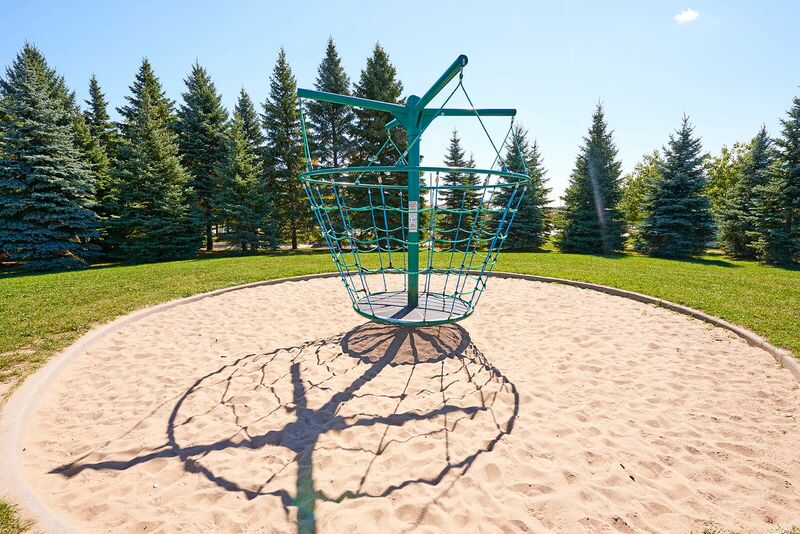 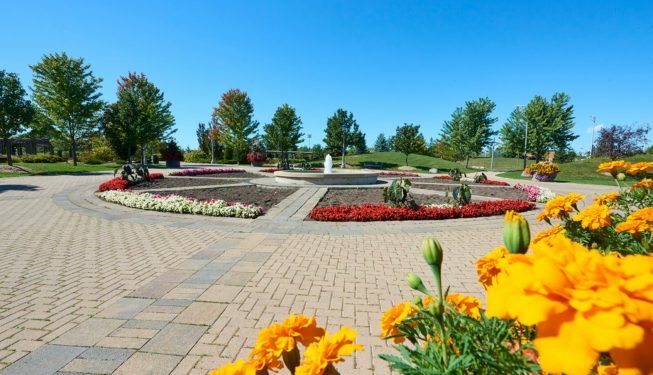 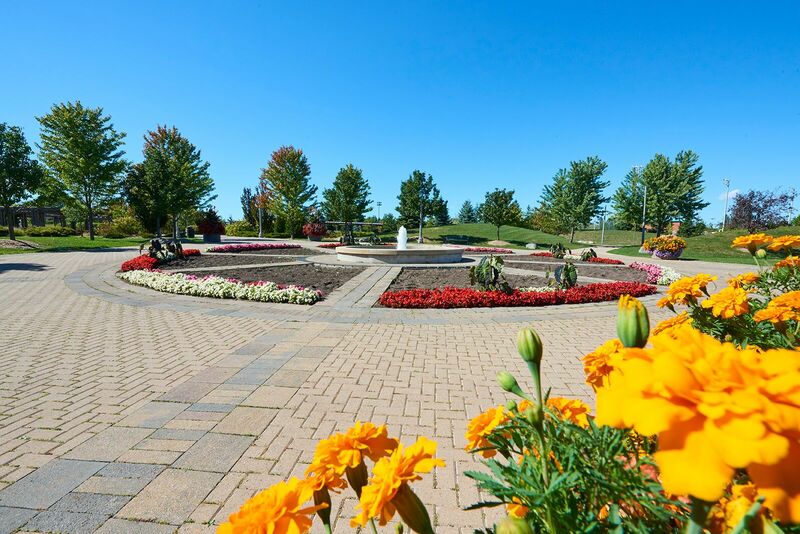 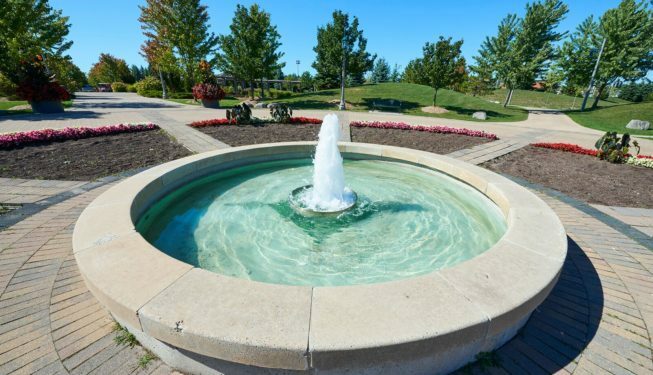 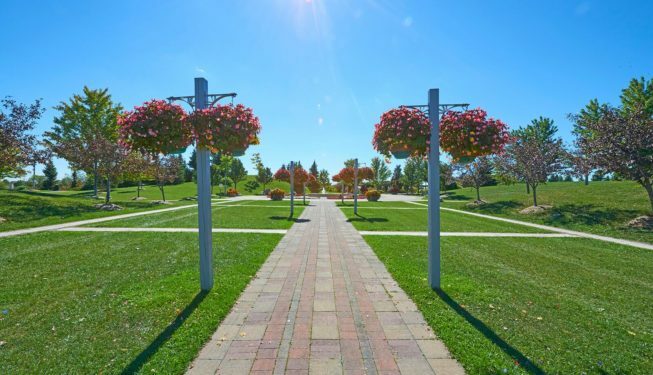 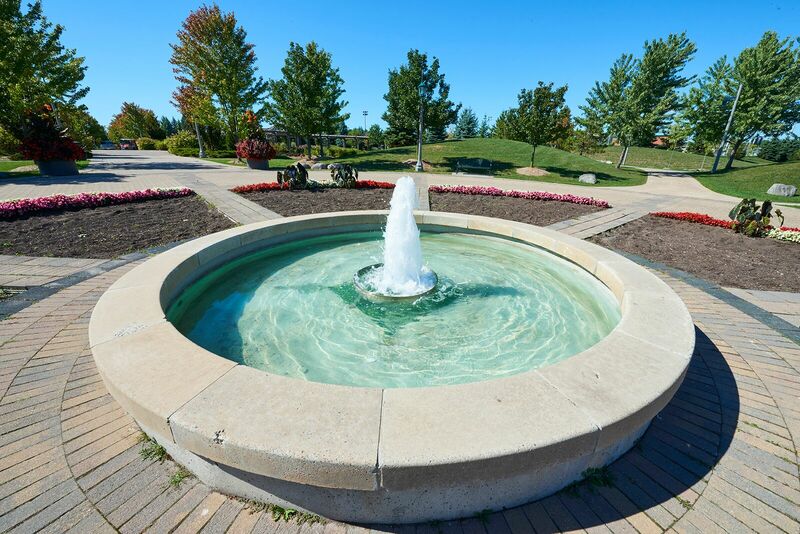 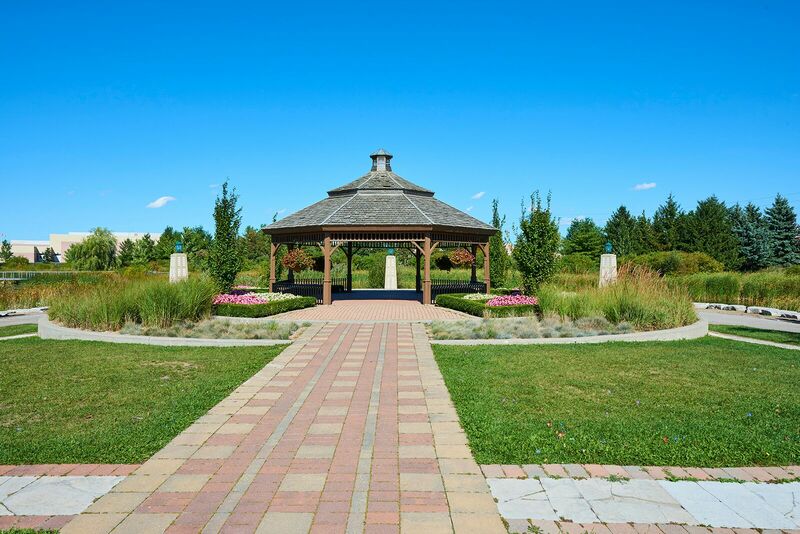 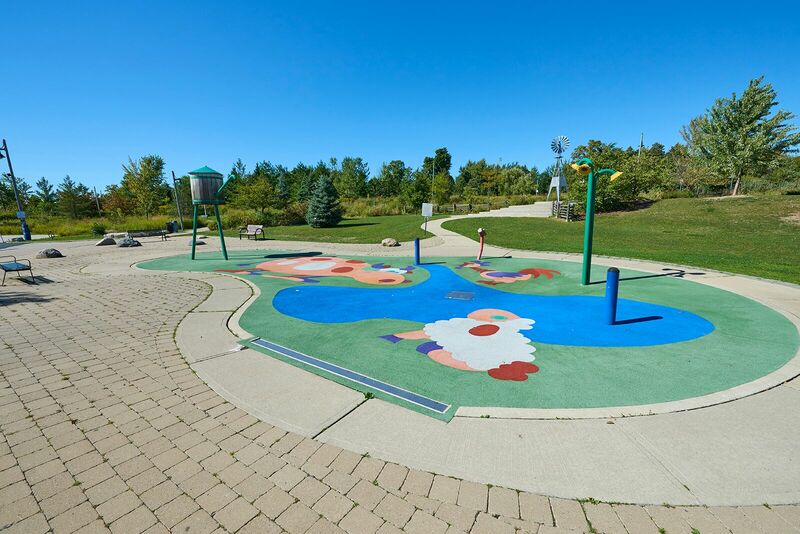 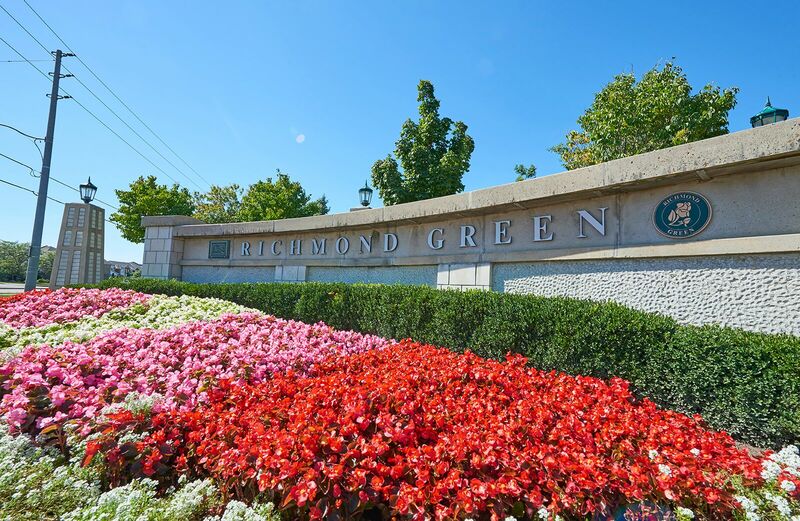 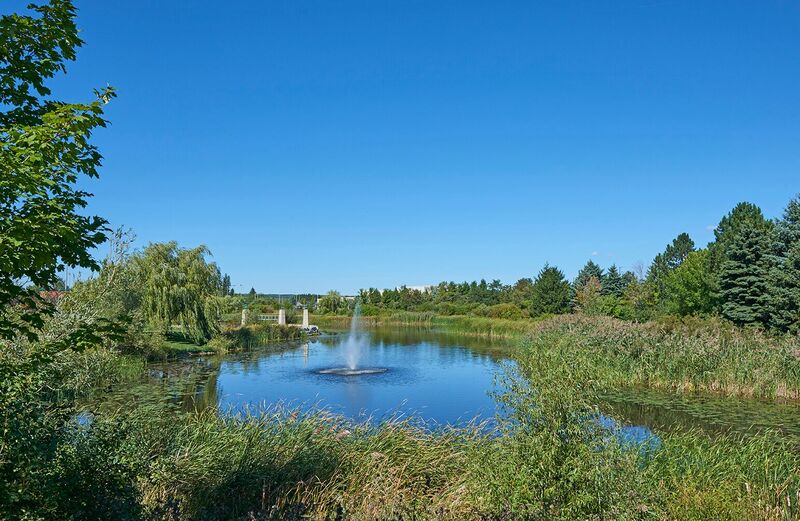 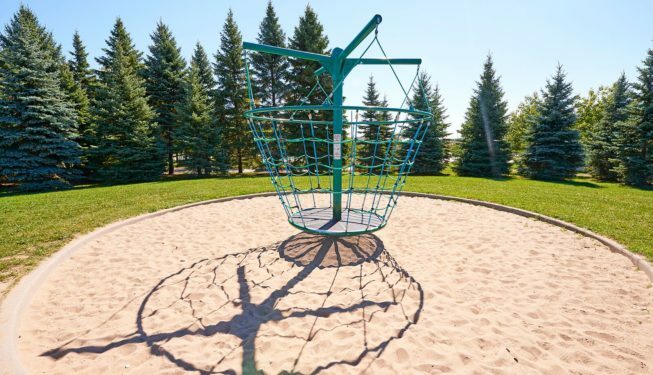 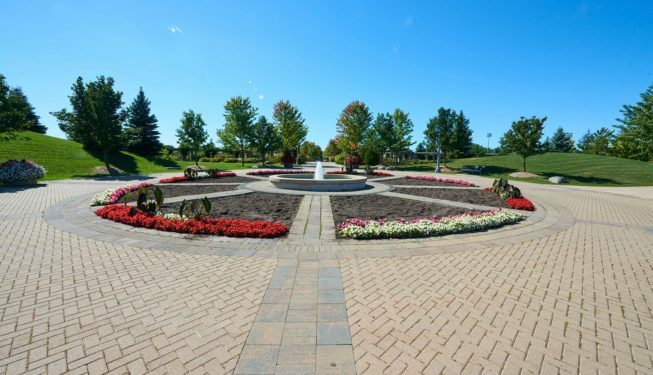 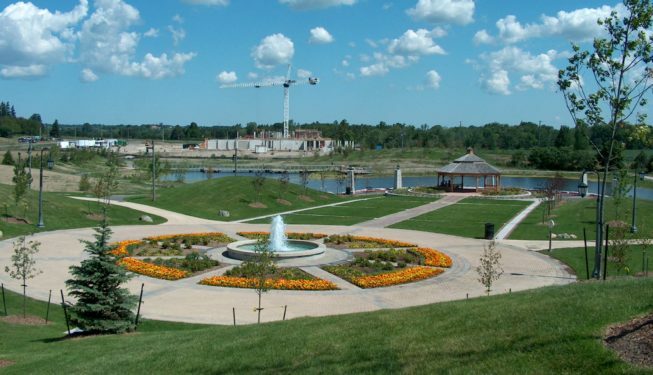 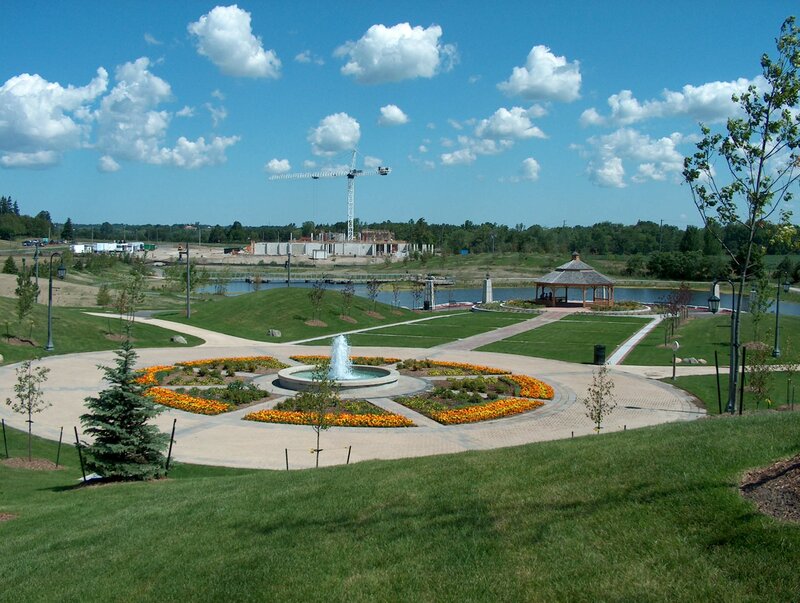 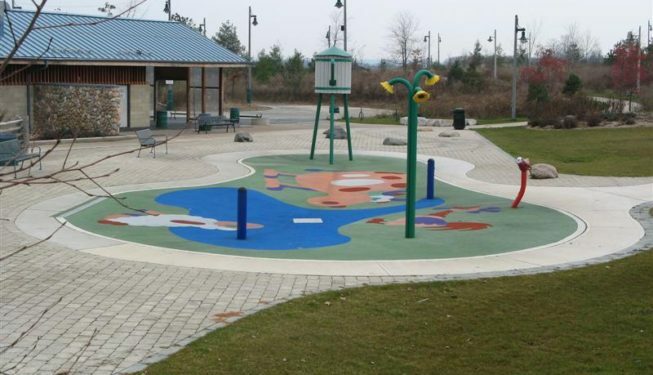 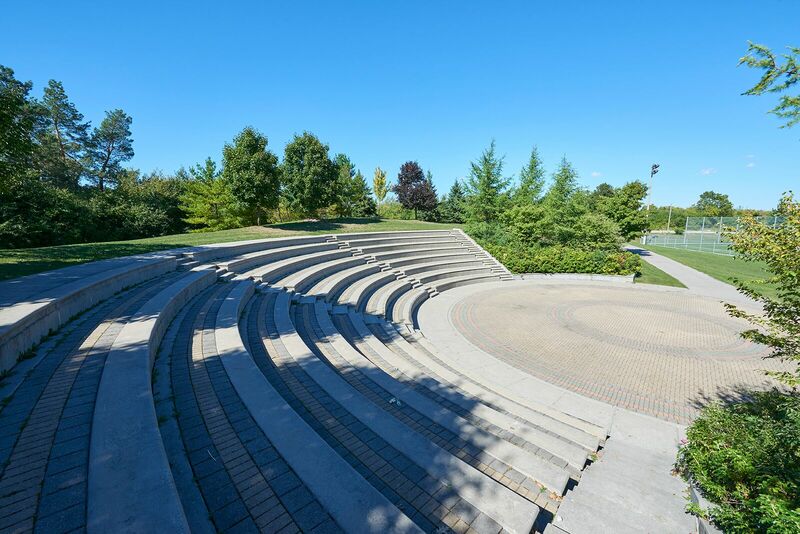 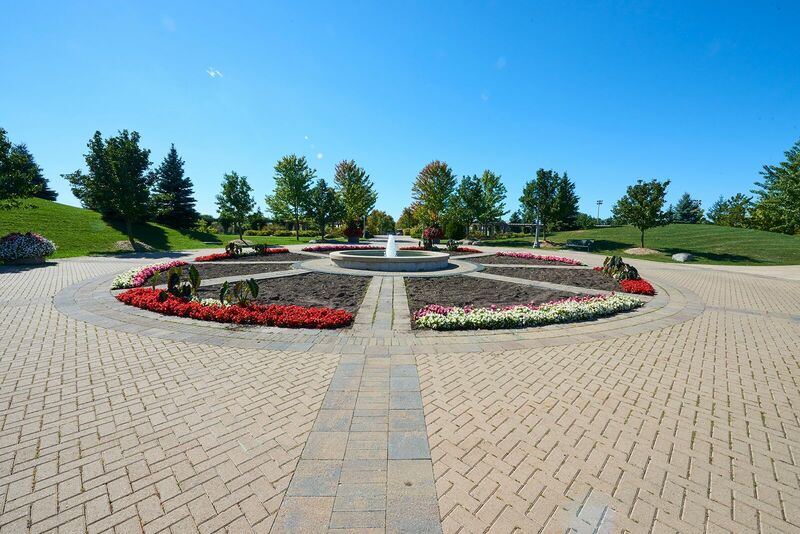 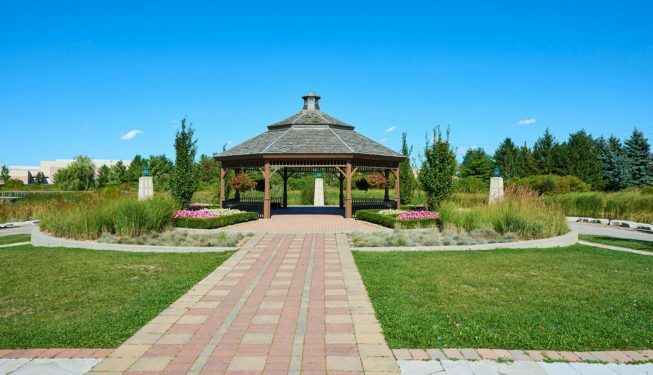 Richmond Green, also known as the Richmond Green Sports Centre and Park is a regional level park located on 102 acres of land on the northwest corner of Leslie and Elgin Mills Road, Richmond Hill, Ontario. 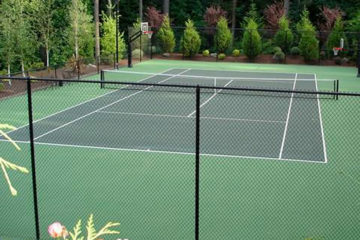 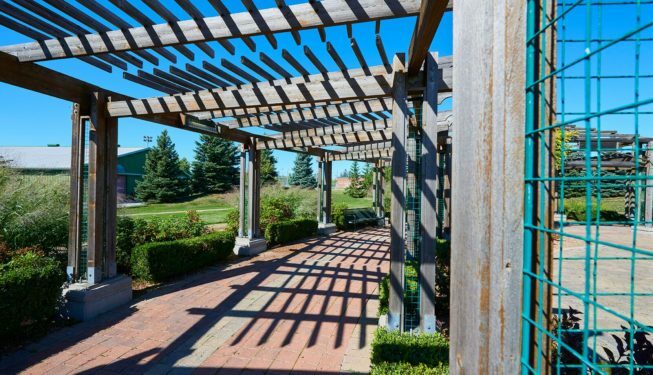 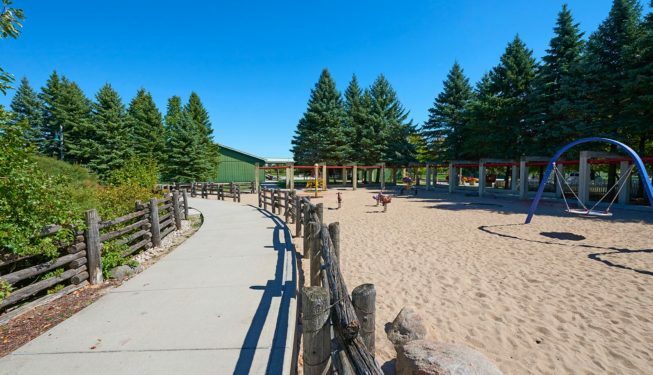 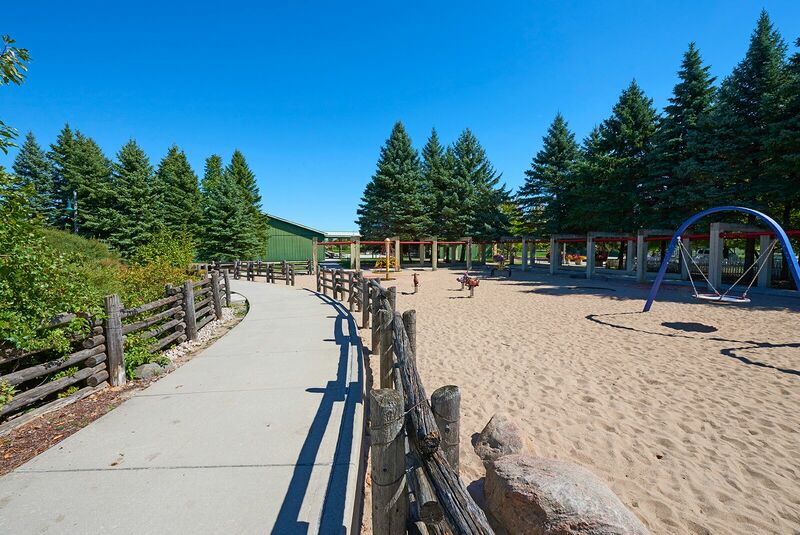 Popularized for it’s beautiful and state-of-the-art construction and landscaped scenery, couples and families enjoy the many features and attractions crafted by Pine Valley. 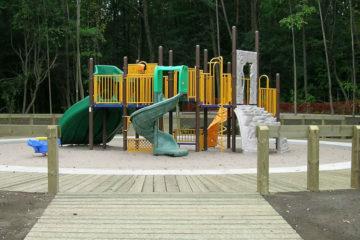 This park’s amenities include a circular asphalt “ring road” that encircles the park property and acts as a parking lot and roadway, a junior soccer pitch, a junior softball diamond with chain link backstop, an artificial ice outdoor skating trail resembling a woodlot meandering trail, a fieldhouse constructed out of Douglas fir, masonry, natural stone and cultured stone. 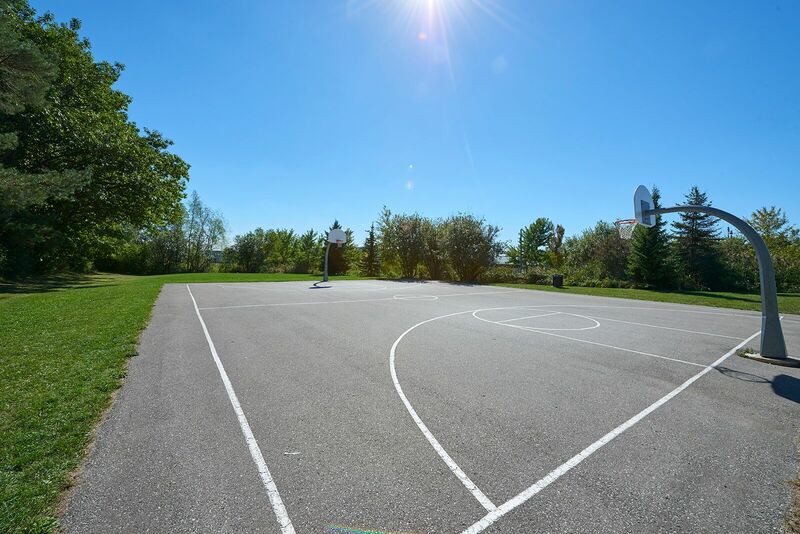 The fieldhouse serves to provide the public with restrooms and locker rooms and is equipped with a large mechanical room to house the ice making equipment and condenser unit. 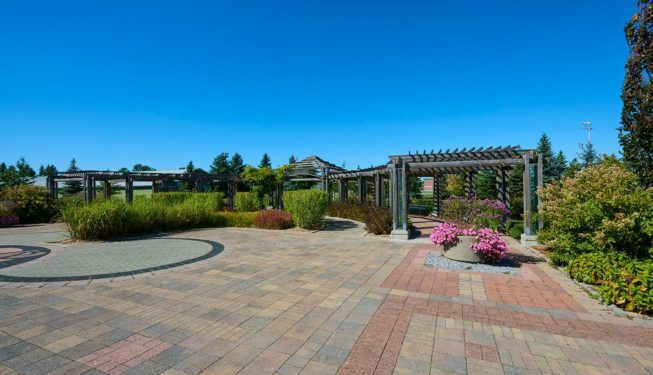 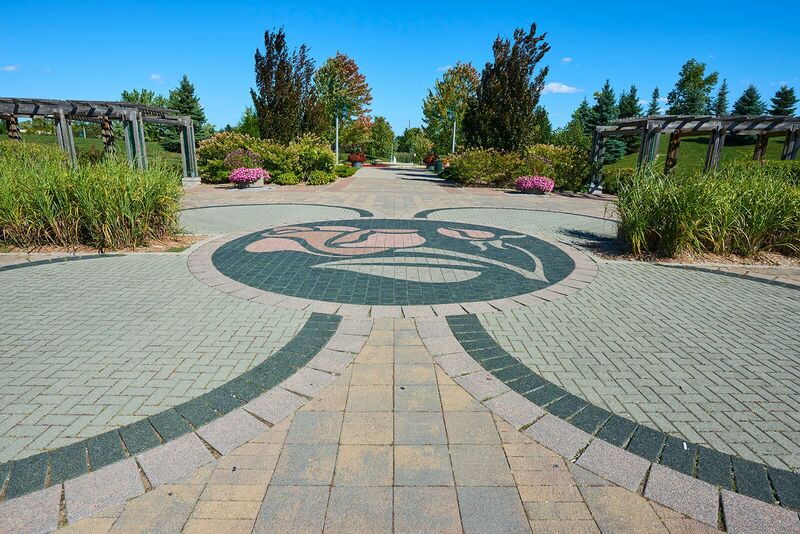 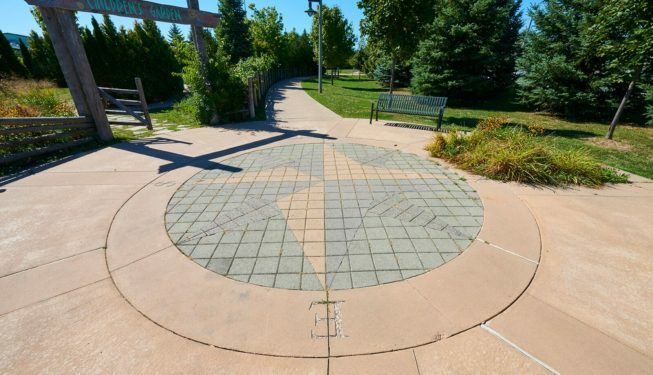 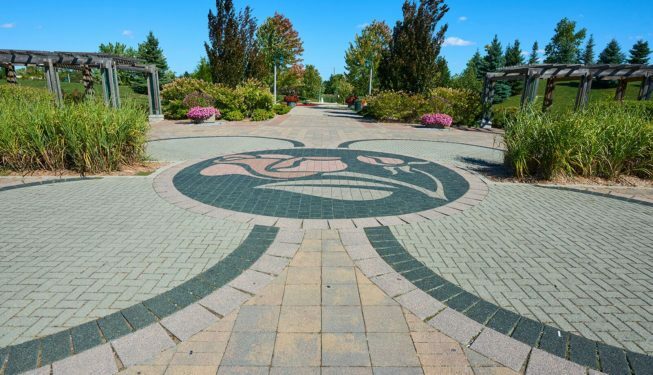 The park contains a splashpad with a rubberized safety surface, a children’s garden where children can explore a variety of plants while they look for inspirational messages sandblasted into the concrete walkways throughout the garden. 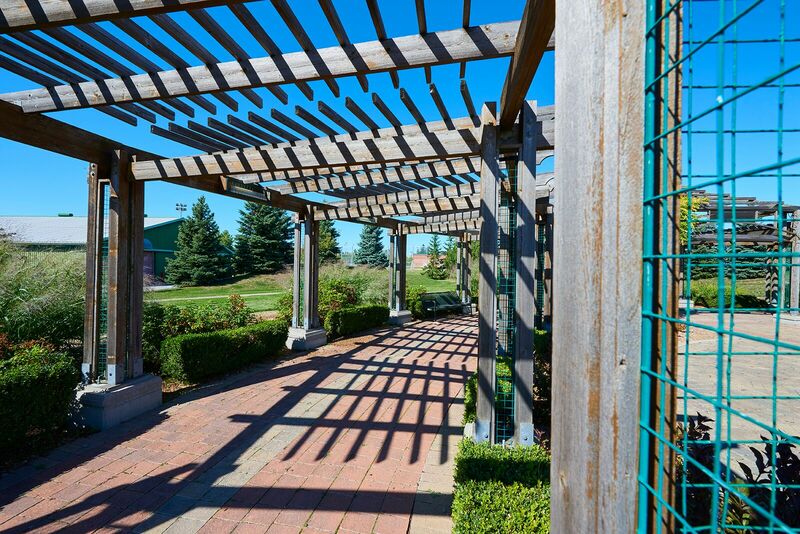 The amenities continue with a large cedar trellis highlighted as one of the focal points of the park. 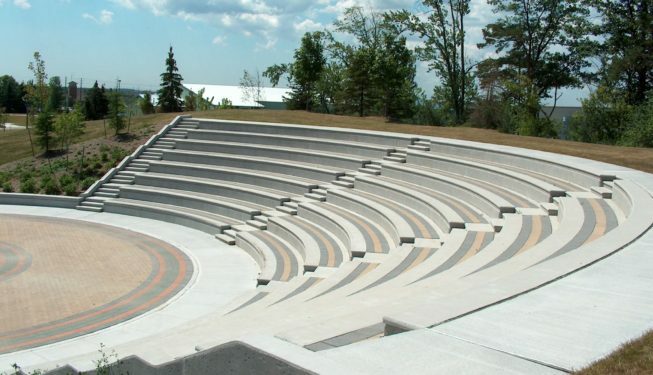 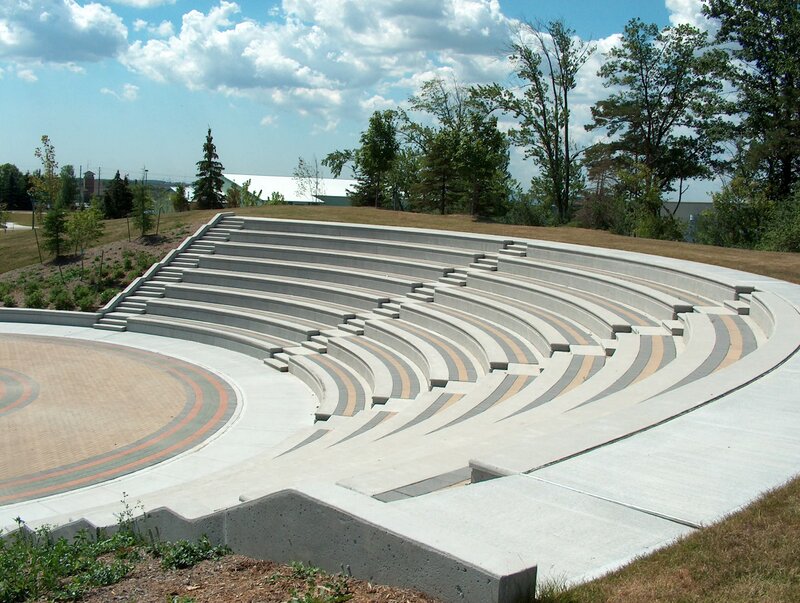 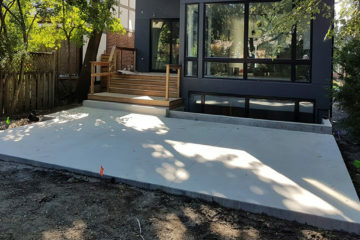 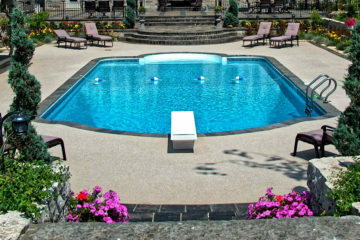 Custom fabricated using Western Red cedar, it is supported by over 70 decorative concrete footings. 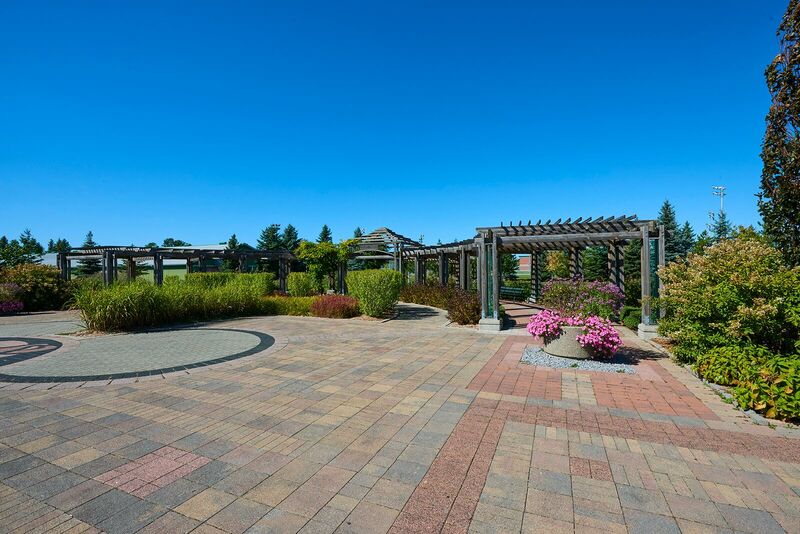 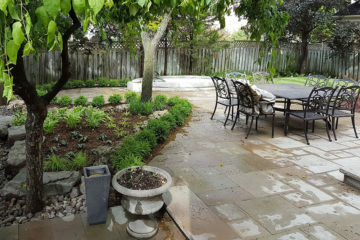 Surrounding the trellis are numerous gardens, all configured to run parallel with the layout of the trellis. 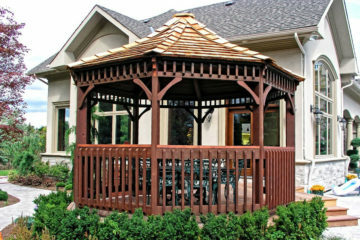 There is a gazebo also constructed from Western Red cedar which overlooks the large East pond. 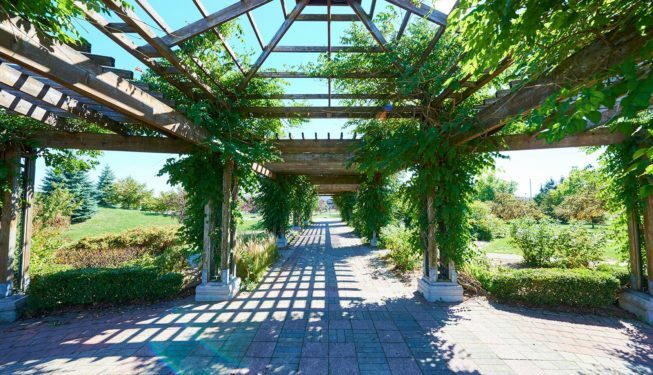 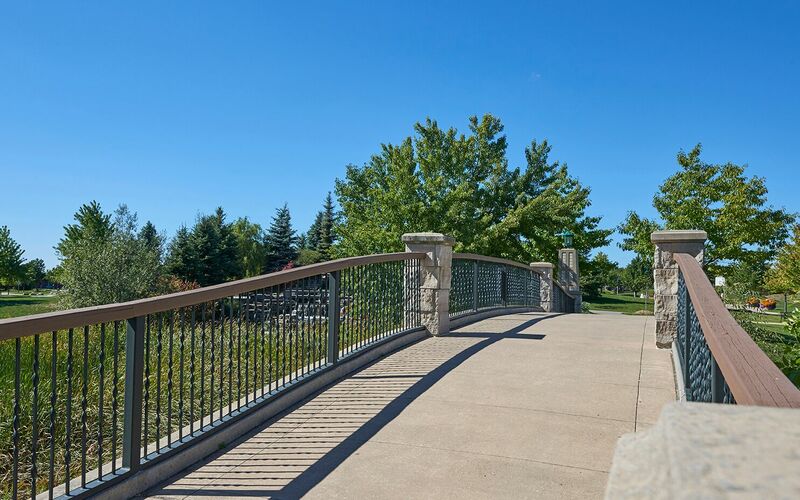 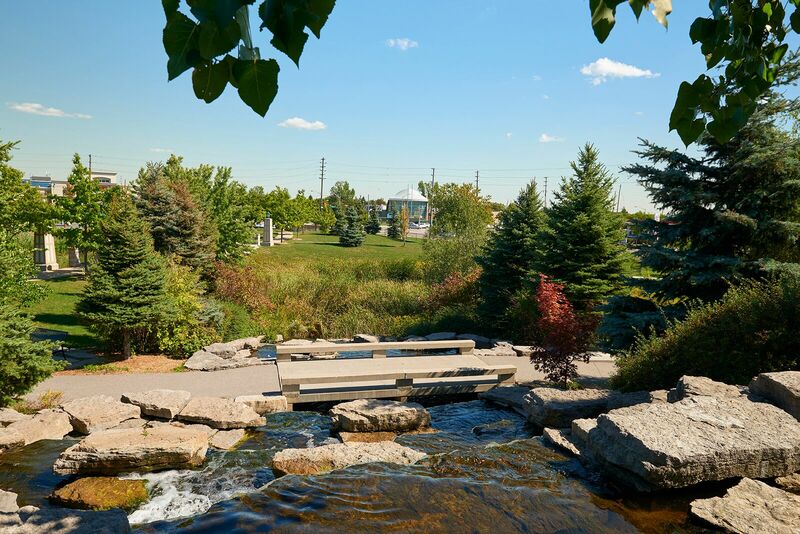 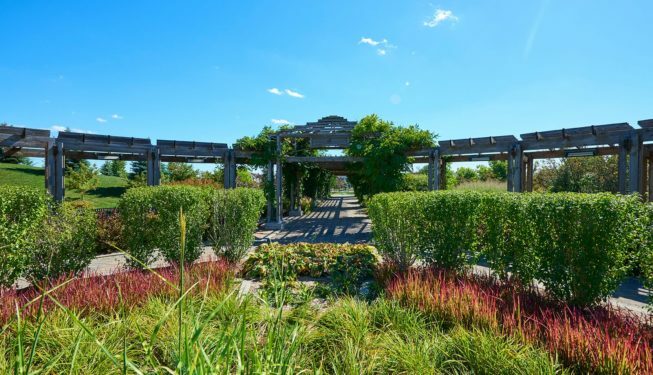 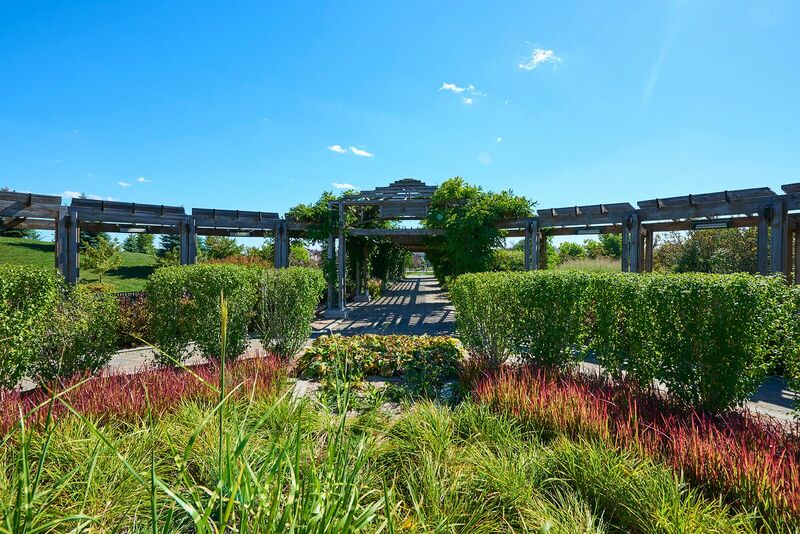 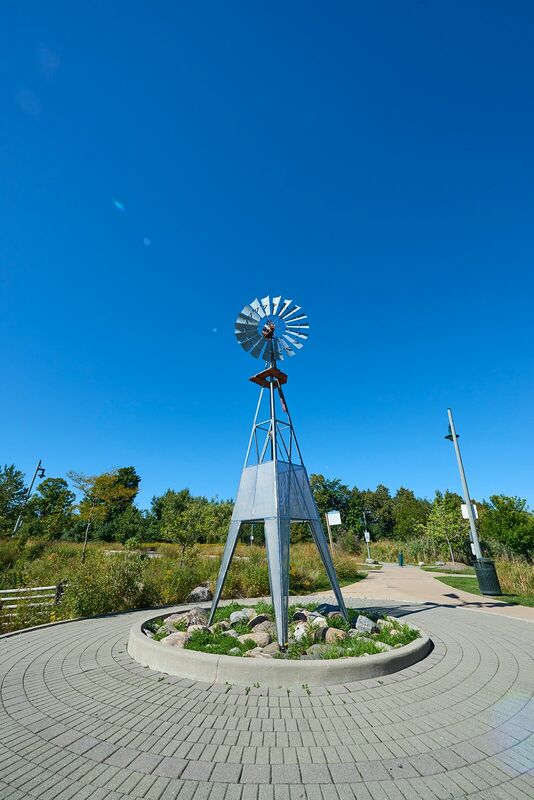 Park patrons can take in the expansive landscaped scenery while crossing the boardwalk which is constructed from a galvanized metal framework anchored to 40 caissons that are imbedded into the pond floor. The boardwalk is completed with wood decking and metal and aviation cable railings. 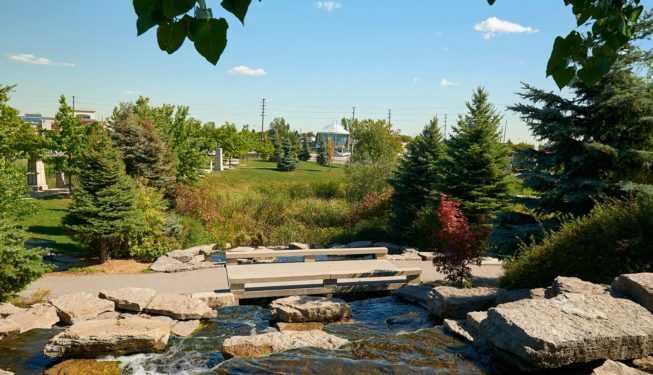 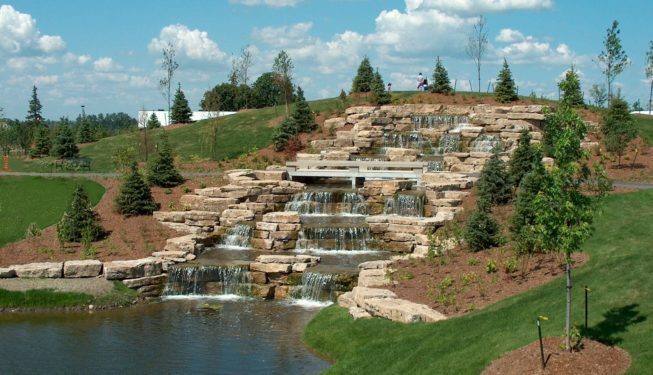 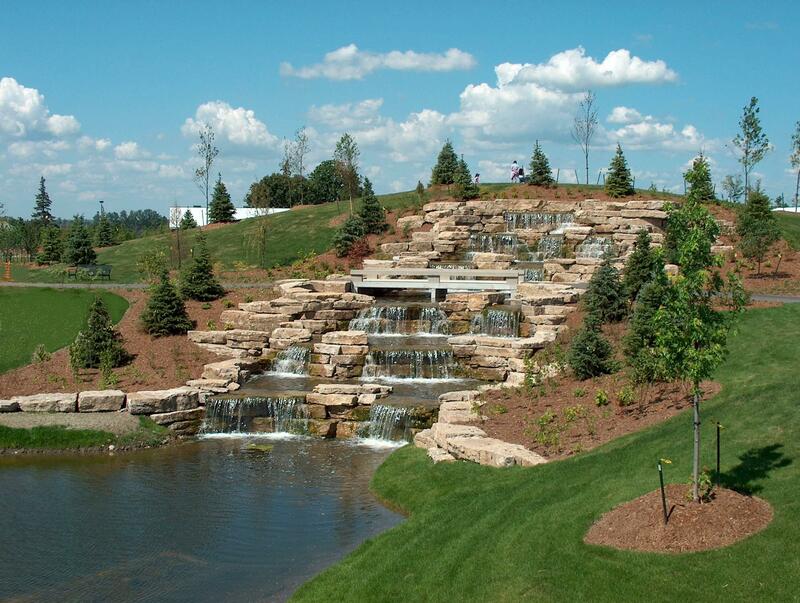 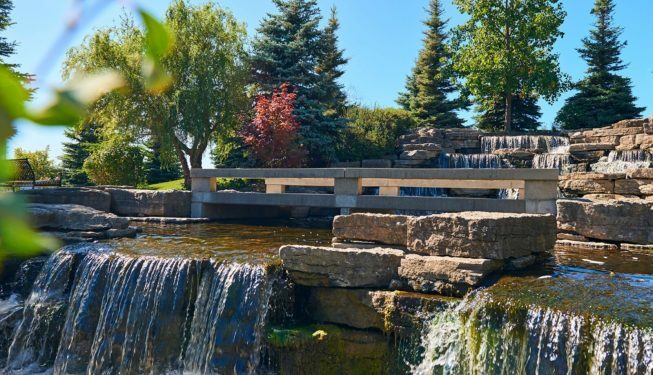 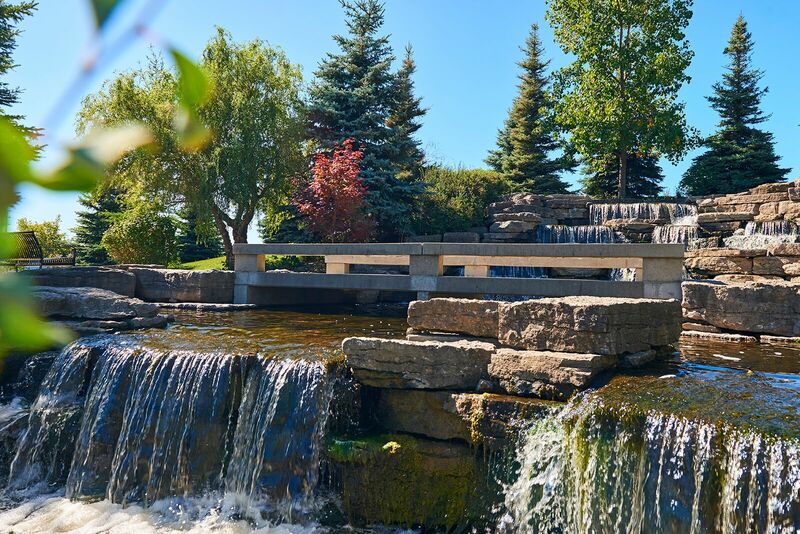 Two of the most prominent features of the park are the natural stone waterfall and the cast in place concrete bridge that provide a scenic backdrop for couples and newlyweds. 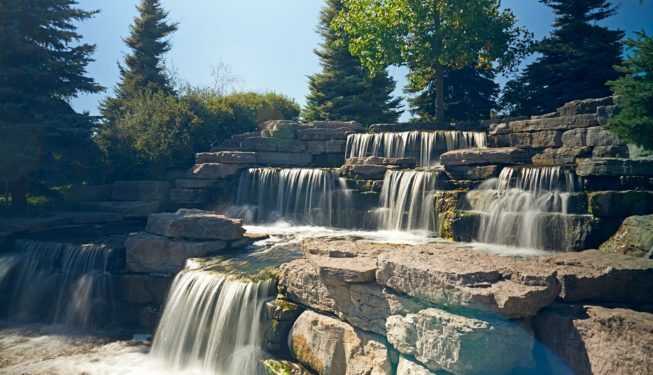 The waterfall is approximately 3 storeys high and has 12 cascades and was constructed by installing 10,000 tonnes of armourstone overtop a formed and poured-in-place concrete sub structure. 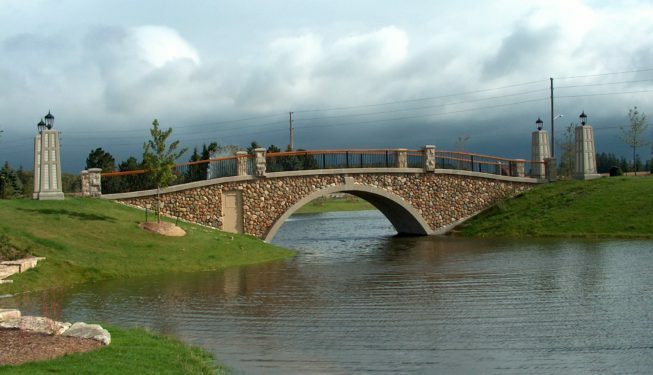 The mechanical systems and pumps used to cascade the water are housed in the bridge’s mechanical room. 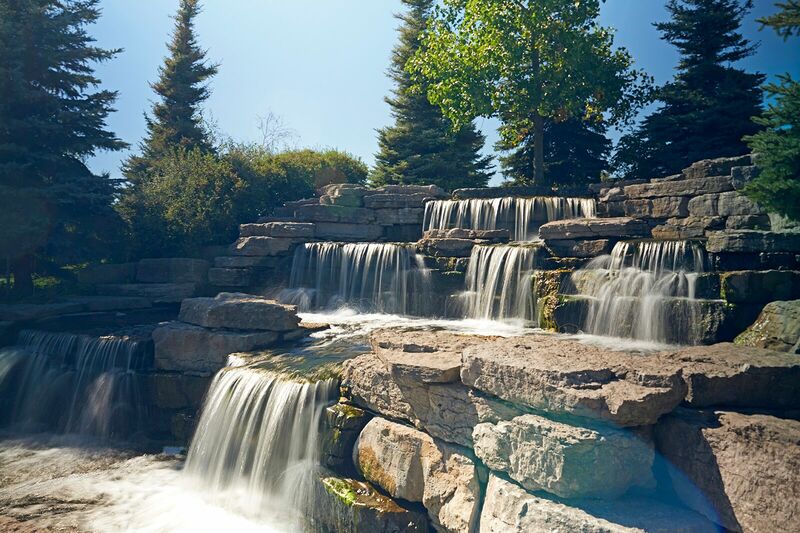 The waterfall is illuminated with submergent lighting for a spectacular nighttime visual. 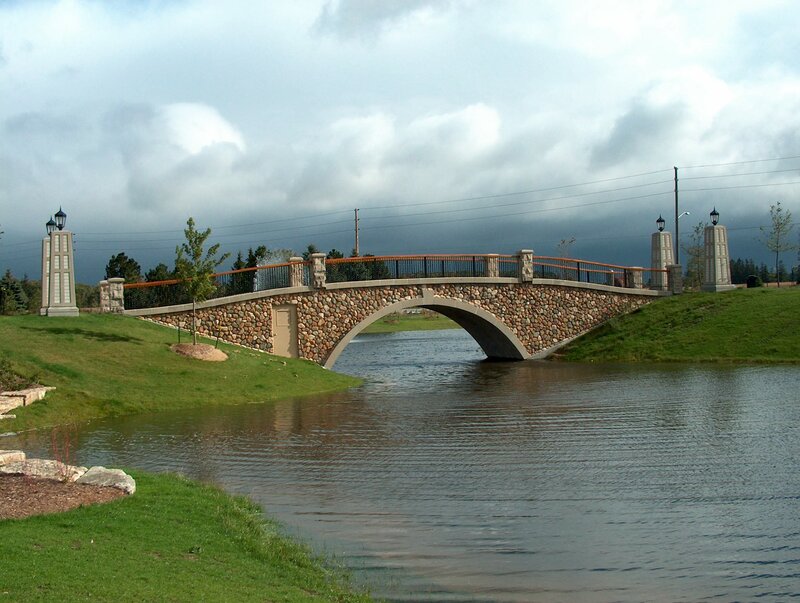 The 30 meter long cast in place bridge takes visitors from the park entrance towards the waterfall and other park features. 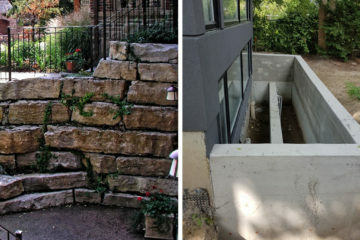 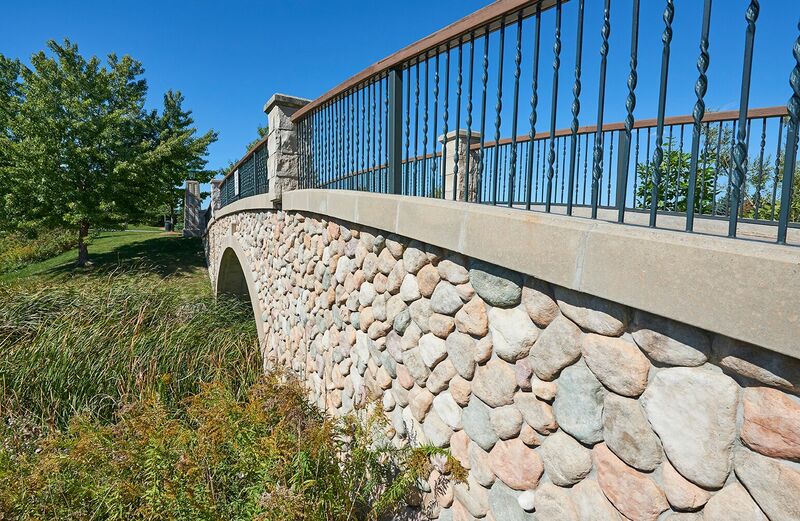 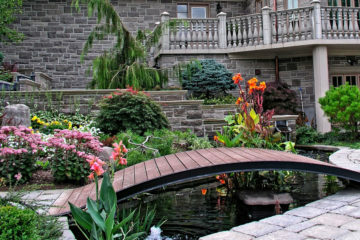 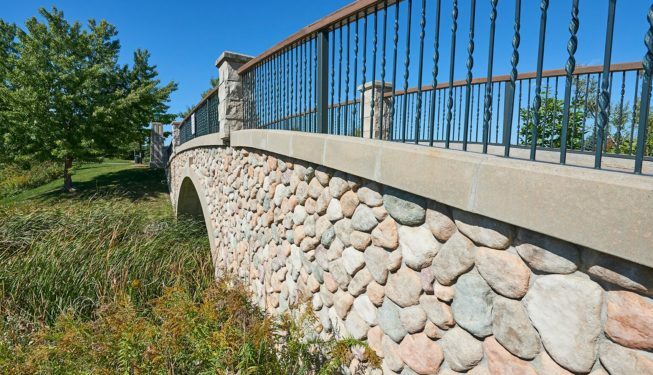 Implemented into the bridge are metal railings with a cedar handrail, coloured concrete walkway and the bridge faces are clad in cultured stone. 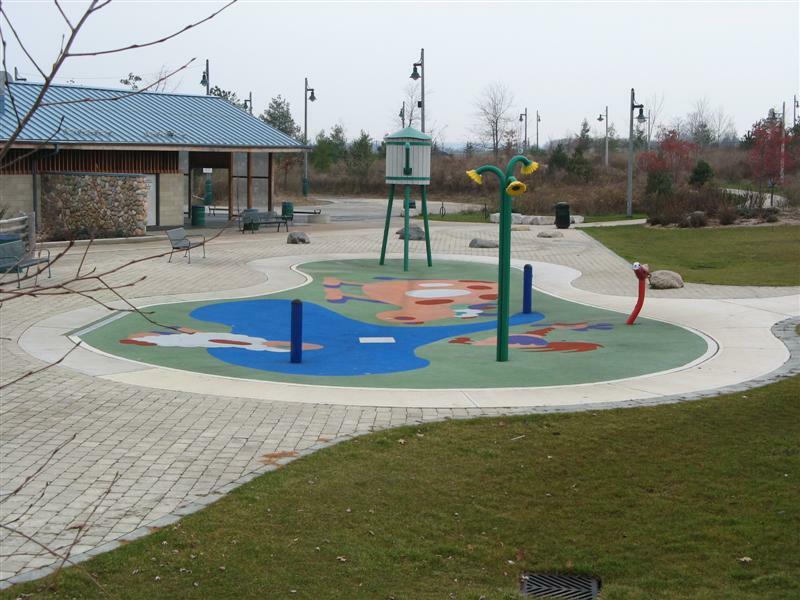 Park servicing included a complete watermain, storm and sanitary serving installation. 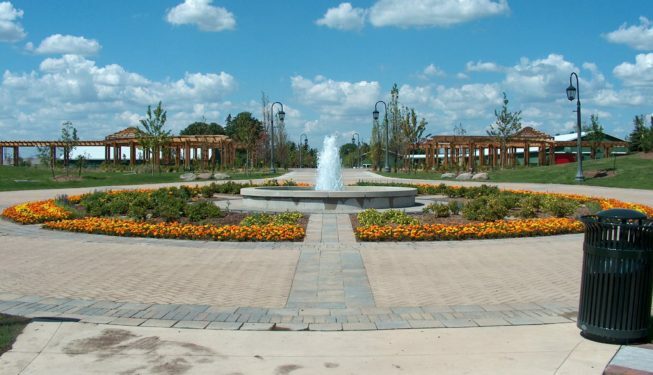 A complete electrical package was implemented consisting of walkway lighting, parking lot lighting and feature lighting for the waterfall, gazebo, fountains, and trellis. 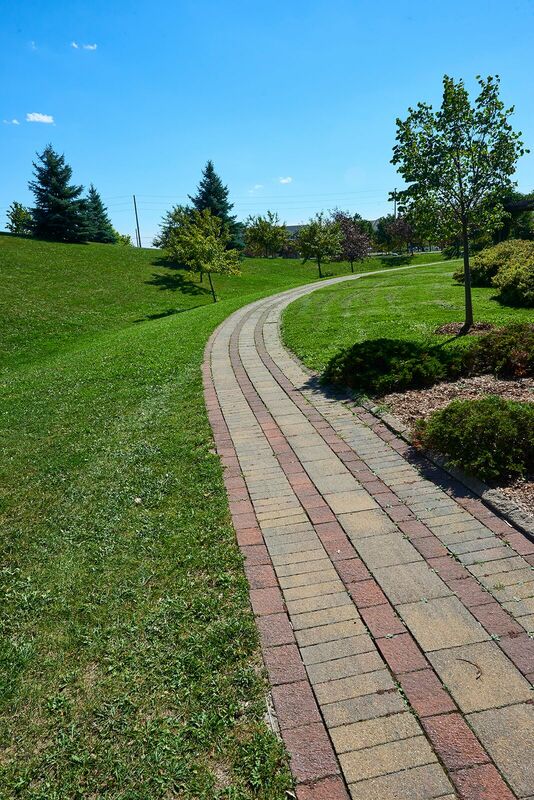 Navigating the park is made easy by the several walkways throughout the property. 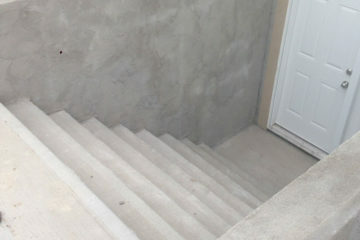 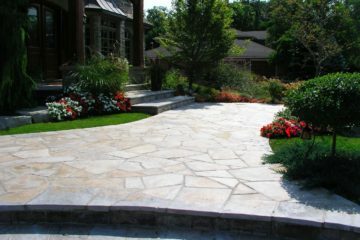 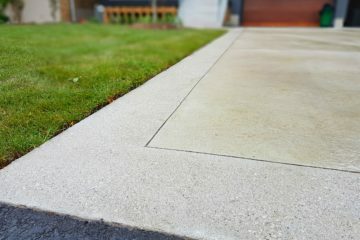 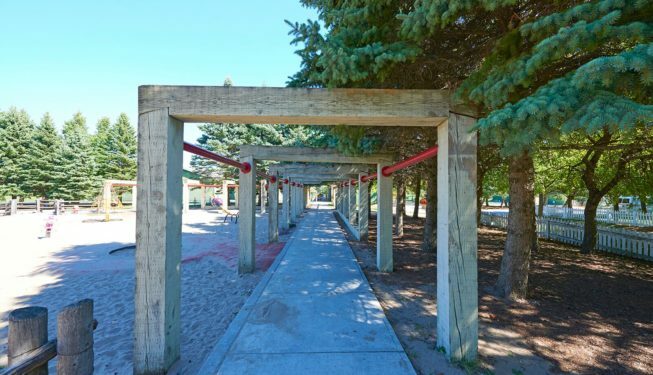 All walkways were constructed using coloured concrete with a banding pattern. 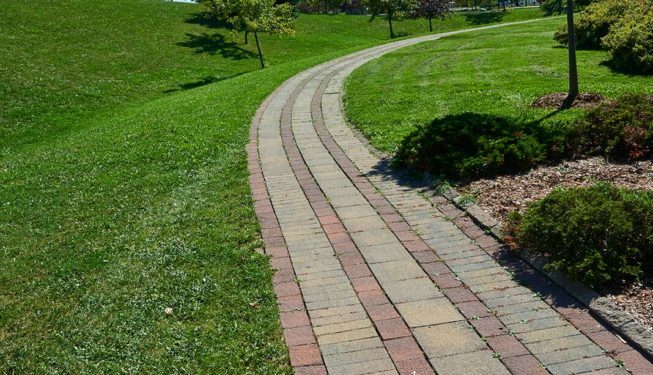 The central spine walkway, known as the “Village Walk Pathway” was constructed using unit paving installed in a quilting pattern known as “tessellating hands” which is all enclosed by concrete banding. 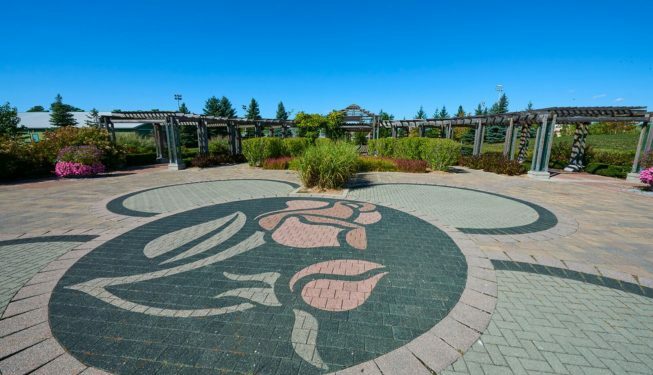 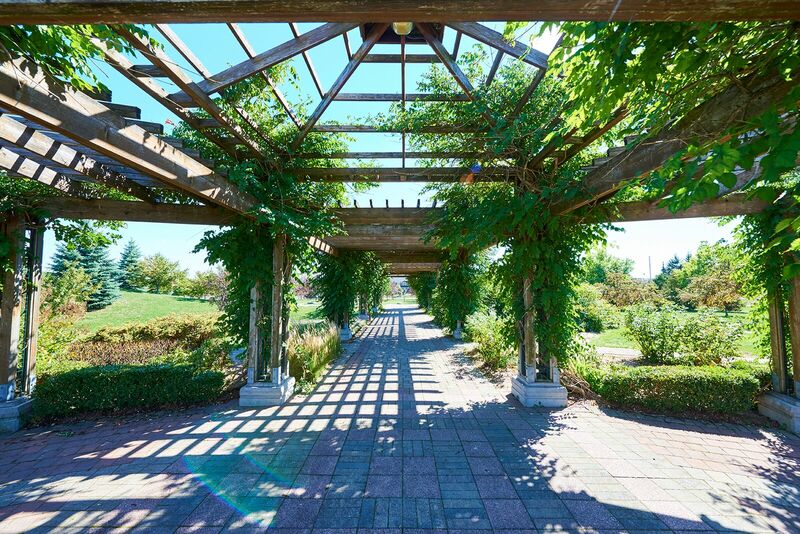 This walkway divides the wood trellis into harmonic halves and right at the center of the walkway and trellis intersection, is the Richmond Rose. 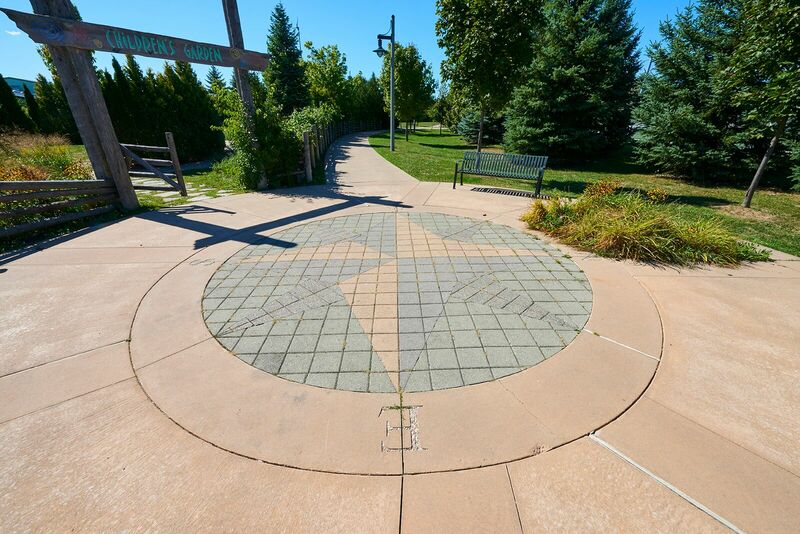 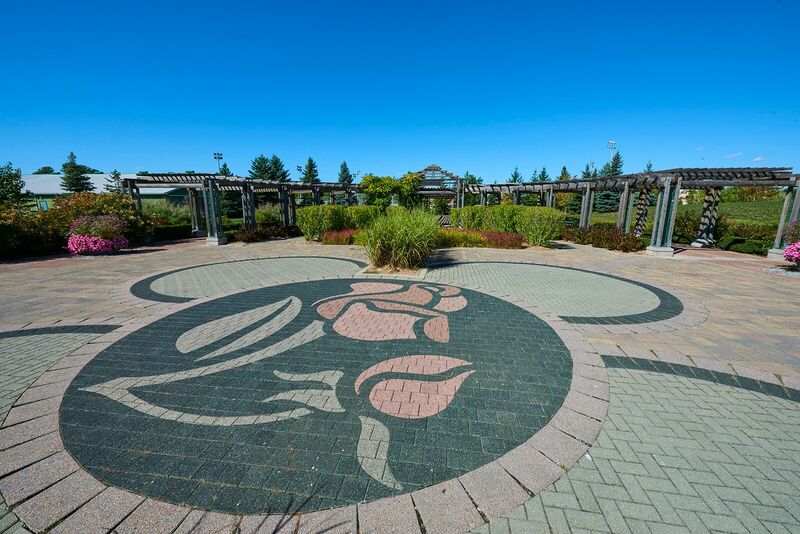 This feature was constructed using unit paving which was precision cut and assembled to replicate the park’s logo. 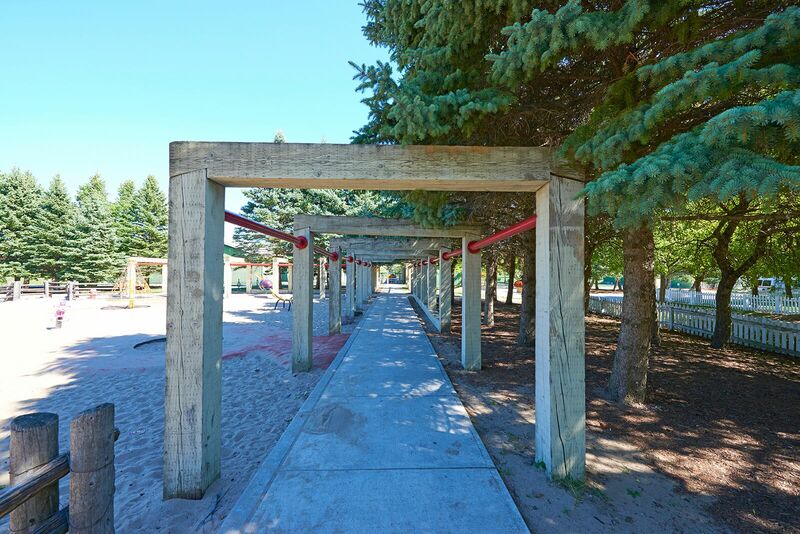 The main park entrance is signified by a large cast-in-place concrete wall. 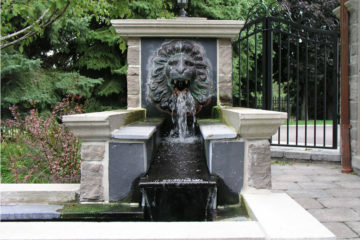 The wall is illuminated so one can see the lettering that spells out the park name at night. 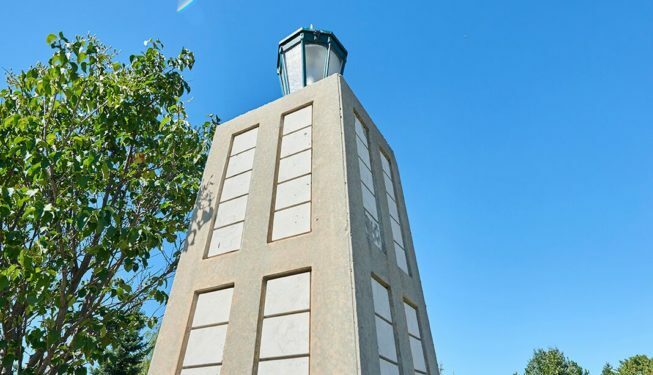 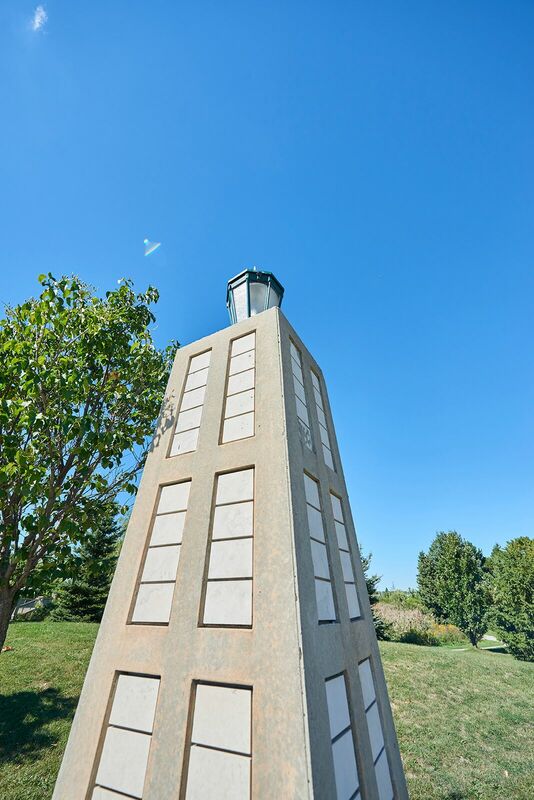 There are numerous lighting columns throughout the park that act as walkway lights resemble obelisks, only shorter and with a light fixture on top! 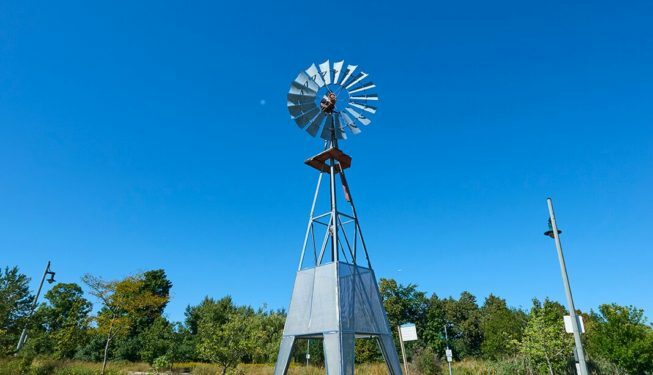 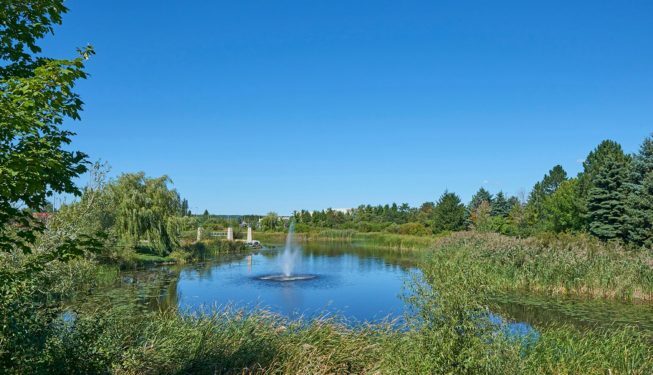 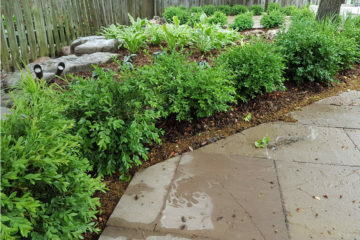 The project was concluded with the revitalization of the west pond, which required that the original pond be drained and the waterflow temporarily diverted away from the work area. 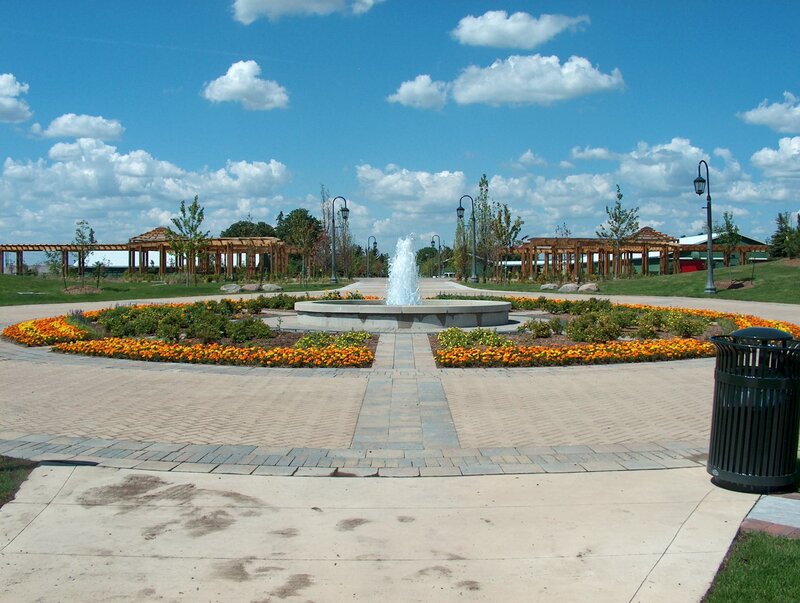 The pond basin and sidewalls were excavated and re-contoured to allow for more efficiency and to become less taxing on the Town’s storm system. 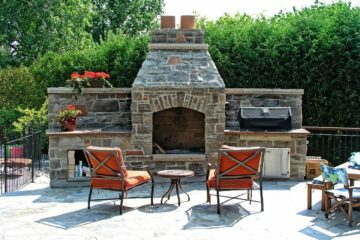 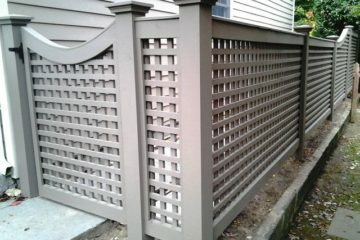 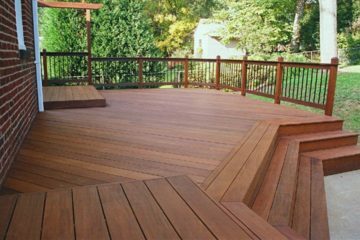 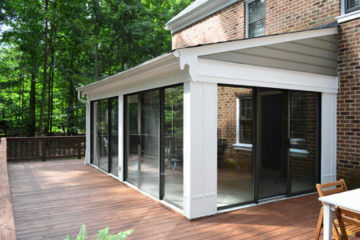 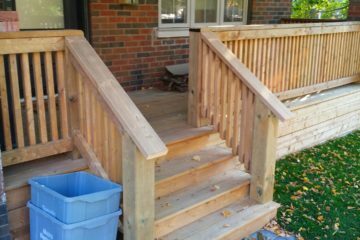 Pine Valley takes great pride in delivering exceptional workmanship and quality that is still evident today.